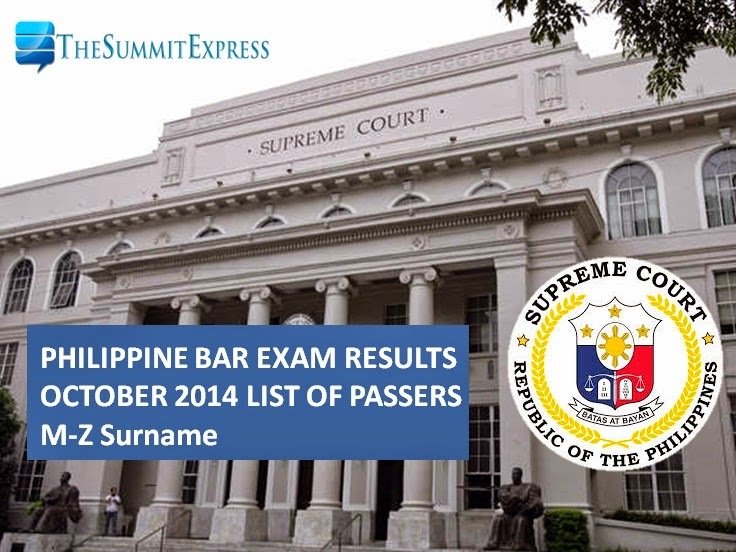 MANILA, Philippines - Those awaiting the results of the 2014 bar exam may find here the full official list of passers as the Supreme Court (SC) finally released the list today, March 26, 2015 at 11:30am through update on its website and at the widescreen in SC front yard. Complete bar exam results are also available on this webpage. SC said that a total of 1126 out of 5,984 (18.82%) successfully hurdled the tests. Examination was conducted on the four Sundays of October 2014 at the University of Santo Tomas in España, Manila. Bar exams committee was led by Supreme Court Associate Justice Diosdado Peralta. SC on Thursday morning said that for bar 2014, they received 6,370 applications but 6,344 were admitted to take the exams. A total of 5,996 showed up on first Sunday but only 5,984 completed all the exams. Bar passers may secure their clearances from the Office of the Bar Confidant during office hours, 8:00a.m. to 4:30p.m. starting April 6 until April 23. The oathtaking schedule for the passers of October 2014 bar exam is set on April 24, 2014 at 3:00pm at the Philippine International Convention Center (PICC), Pasay City. For #BAR2014 passers, oath taking is on April 24, 2015 at 3 PM. Clearances may be secured starting April 6 until April 23, 8 AM to 430 PM. The 2014 Philippine Bar exam is consists of 20% multiple choice questions and 80% essay-type questions same with the previous year examination structure. In 2013 bar exam, the passing percentage was 22.18% (1,174 out of the 5,292) higher than the 2012 outcome of 17.76%. In October 2011, passing rate was 31.95% ( 1,913 out of 5,987) and recorded as second on the history of highest passing rate since 2001. 2001 has 32.89% (1,266 out of 3,849) successful examinees.